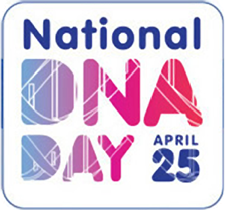 Next Tuesday, April 25th, is National DNA Day. Now, only one of those events was on April 25th. But whether we should have celebrated last Friday or back in February or waited until next week or next February, one thing we’re all in time for: a National DNA Day celebration sale on almost all of the tests offered by many of the DNA companies. And here’s one thing more: if we buy test kits through the links you can find here, at the Your Genetic Genealogist blog written by CeCe Moore, we can help people who couldn’t otherwise afford to have their DNA tested: people who are adoptees or foundlings or have unknown parentage problems, and limited financial resources. • Family Tree DNA: $20 off the Family Finder autosomal test ($59, down from $79); $50 off the mitochondrial (mtDNA) full sequence test ($149, down from $199), and $40 off the YDNA37 marker test ($129, down from $169) — and other savings to boot, on the Y67, Y111, Big Y and SNP tests. • AncestryDNA: 20% off in the United States, $30 off in Canada, and 25% off in the UK. • LivingDNA: $40 off its test — currently an ethnicity test with matching to come ($119, down from $159 in the UK, and £119 down from £159 in the UK). All of these links on this page — which will be updated if any additional sales are announced — benefit the DNA Detectives Kits of Kindness Program with a percentage of all commissions going to the donated kits. What, you ask, is the DNA Detectives Kits of Kindness Program? First off, the DNA Detectives Facebook group is a group dedicated to helping those with unknown parentage situations find their families. It’s a private group; you have to ask to join; posts in the group are not to be shared outside of the group. The program gets kits directly — people donate a kit for use by someone else — or through donations that fund the purchase of kits or — as now — through the small amounts it receives from each kit bought through a referral link. So… bottom line… you know you want to DNA test. You know you want your siblings and parents and aunts and uncles and cousins to DNA test. And you know you want to save money. So buy your test kits during the annual National DNA Day sales and save money. And by buying them through the referral links for the DNA Detectives Kits of Kindness Program, you not only save money, you do good as well. Judy, thanks a bunch for posting the DNA sales. First time I have heard of the DNA kits for kindness facebook page. Seems this might benefit a few folks who just do not have the funds and are seeking their birth parents. Thank you for mentioning Rosalind Franklin’s immense contribution to the DNA story! Thank you very much, Judy, for highlighting our Kits of Kindness program. This was very, very kind of you and will be greatly appreciated by the many recipients who will benefit from your post and your readers’ support. My great grandmother was 1/2 Chickasaw. A friend told me if I can prove I am part Chickasaw it might help my children in scholarships for college and possibly other money. Can u help me with this question?? First, you would need to check with the Chickasaw Nation to see what proofs it requires for enrollment. Most tribes do not accept DNA evidence when the person is as far removed from a Native ancestor as you are. Second, no DNA test can distinguish tribal descent: it might tell you whether you have Native American ancestry but could not tell you what tribe. Hi Judy – This is so exciting! I’m African American and really want to know what NATIONALITY PERCENTAGES I have in me from across the globe, in the most accurate way 🙂 I see you only listed Family Tree DNA, AncestryDNA, and LivingDNA. I’m searching for the most cost effective way to get the widest most accurate information about my bloodline. Do you recommend I individually purchase and take all three of these test then compare notes? You are asking about the absolute rock-bottom least accurate aspect of DNA testing. Every company is excellent at discerning European, African, Asian — continental level results. Getting to the country level is much more difficult, depends on the rate of admixture in the population and the size of the reference population. And African reference populations are among the smaller ones for every company. So getting accurate information at the level you want may not be doable at this point. If you’re in a mood to go for it on a “you pays your money, you takes your chances” basis, the two companies with the largest African reference populations are AncestryDNA and 23andMe. But understand: you can NOT rely on the percentages. The science just isn’t there yet. There’s also a sale on 23andMe for Mother’s day> $20 off the ($99) ancestry kit.